Finals are done! They've been done for over a week now. I really didn't get up to a whole lot of shenanigans this semester. At least, not any as creative as my usual final exam shenanigans. They were mostly boring. Like Facebook, YouTube, whatever. I also actually didn't have a lot of time to get up to shenanigans. I had only one final exam, which was on Tuesday of finals week, and then I had a take-home final essay-ish-thing that was due the same day. I also had a creative writing assignment due, but... it was due "sometime during finals week." I love creative writing teachers. So I didn't have a lot of time for creative shenanigans, but I did do a few silly things. And I will post them now! And over the next few days, as I think of them. That's how I felt while studying and writing. I actually said this out loud at least once. 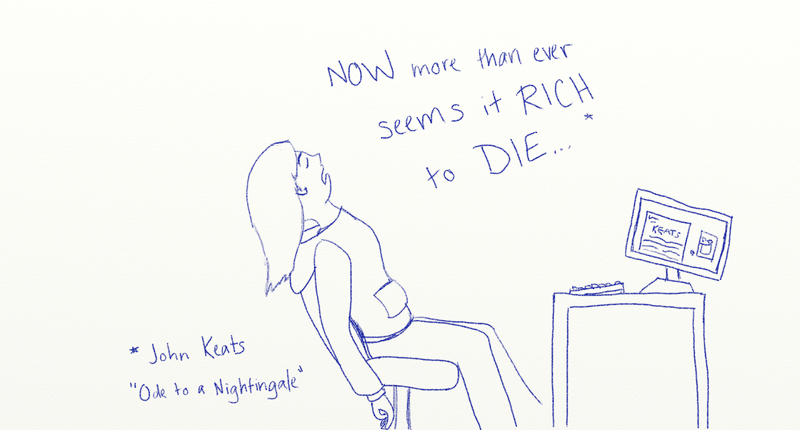 I've really got nothing against John Keats. In fact, I enjoyed studying a great deal of his poetry this semester. I just didn't really appreciate writing papers and essays and stuff like that. I never do. I would probably like it all a bit more if I could learn to write papers before the last minute, but... yeah. I haven't drawn much on my tablet in a while. I'm trying to get back in the swing of it. I'll be practicing on it, not necessarily doing finished cartoons. I might post a few of the sketches up here for the fun of it.